Someday, I would like to have pecan trees in my yard. I say things like this all the time, whether it could actually happen or not. Basically any plant with a culinary use is welcome in my yard. I couldn’t have just one of each because many of these require multiple trees for cross-pollination. Michael and I would have to acquire some serious acreage in several states if we were to try and make this little dream of mine actually happen, so I’m not banking on it. But you never know, we could always win the lottery! Out of all the flora in my list, I have the best shot at having pecan, cherry, or apple trees. Pecan trees are native to the North America and grow wild in the Southern and Southeastern states, and they can be cultivated in Zones 5-9. Since we live on the border of Zones 6 & 7, we could technically cultivate pecan trees, but they can grow very large, up to 40 meters tall, and our little lot doesn’t have room for trees that big. Although pecans have been cultivated in North America since the 16th century, commercial propagation of the pecan tree began in the 1880s in Louisiana and Texas. Coincidentally, the process for refining corn sugar was developed around the same time, so although pecan pie made with corn syrup is most definitely a Southern tradition, it’s not necessarily steeped in history. The traditional corn syrup recipe is becoming somewhat controversial in food circles. Some people leave out the corn syrup and make a custard instead, and there are also recipes using sorghum or other cane syrups. 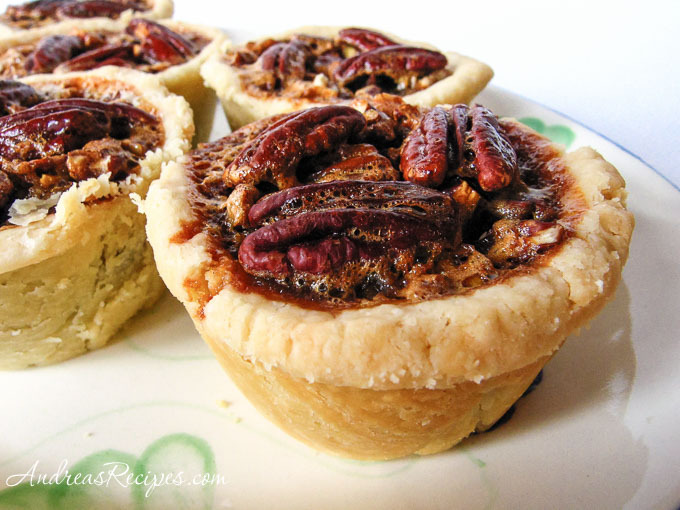 I grew up on my mother’s and grandmothers’ corn syrup pecan pies, so that’s what my recipe uses. Mini foods work well for my family since the boys are so young, and smaller portions are just better for everything, especially a dessert as rich as this. These mini chocolate pecan pies are my contribution to Sugar High Friday #34, Going Local, a brilliant idea for this months event hosted by Johanna of The Passionate Cook. Check her website for the round-up on Friday August 31. Divide the dough into 12 equal pieces and roll into balls. Press each ball in the bottom and around the sides of each muffin cup. Work the dough all the way to the top of the muffin cup. In the bottom of each muffin cup, add 1 tablespoon chocolate chips and 1 tablespoon chopped pecans, then arrange 3 pecan halves on top of each. In a mixing bowl, whisk together the eggs, granulated sugar, brown sugar, corn syrup, Kahlúa, vanilla, and salt. Pour the filling over the pecans, making sure all of the pecans are coated in the mixture. Bake for about 45 minutes, until the filling is set and the crusts are golden. Remove from the oven and cool in the pan for at least 30 minutes. Remove them gently with a plastic knife. Keep pies in the refrigerator for up to 3 days. To freeze the pies, chill them first, then wrap each one thoroughly with two layers of plastic wrap. Put them into a freezer bag. They will keep for up to 2 months. Yeah, I have yet to find a friend with a pecan tree…but I do have a friend with a hazelnut tree which is nice. Your little tarts look yummy. Oh, they look absolutely fabulous! Yummy! I would like to have a Mini Chocolate Pecan Tart Tree or two growing in my yard! We do have a lemon and lime tree in pots around our swimming pool and it’s awesome to just go out in the back yard and pull one off of it when you need it. I too would love a yard full of different fruit trees! Andrea…pleaaaasse…I am trying to still fit into my clothes!!!! With all these delicious recipes on your blog you are making it very difficult fo me. I have no self control. I have already started planning what I want to plant next year, so I know how you feel! I love pecan pie, so I am guessing that the addition of chocolate makes it so much better! Peabody, Rose, Ahn: Thank you! And they are quite easy, too. Zebra: Oh, I am jealous of your lemon and lime trees. Valli: Yeah, I can’t have any treats for the next few weeks because I have a bridesmaid dress that I must fit into on Sep 22! The baby pies look adorable! I love the fact that you use muffin cups and not the specialty mini tart pans. I might try this recipe for Thanksgiving this year. i love pecans, too! but wouldn’t even think of growing them myself… not much of a green finger, really! our garden is realy small, too, but on my recent vacation on a farm in austria, i came to love having the orchard just behind the house… yeah, i’ll keep on dreaming, too! thanks for your contribution to SHF34! Cris, I am a bit envious of your friend, and I hope you get your lime and orange trees soon! Amy, I was thinking I might try to grow one indoors. I’ve had miserable luck with that in the past, but I think I’m game to try again. Nupur, thanks! I think the muffin tin works very well for these. Johanna, that’s quite an incredible round-up for this months SHF! Thanks so much for hosting. Great theme! These look fantastic. I love the addition of Kahlua. We’ve always used maple syrup in pecan pie. Andrea, these are beautiful! I love tartlettes–they’re the perfect size! I’m so excited about this recipe! I used to eat little tarts like this as a kid in the cafeteria growing up in North Carolina, and I haven’t had anything like it in the longest time. The combination of pecans and chcoolate is just heavenly to me. I also feel for you on the desire for fruit trees. Here in Iowa the produce pickings can be very slim, especially when it comes to fruit. I only wish I had some land for an orchard or vegetable garden, or even just a windowsill wide enough to grow herbs! We have the great fortune of an old house with the remains of a pecan grove. There are 10 beautiful pecan trees that are over 150 years old in the yard and they bless us with @ 40- 60 lbs (yes that’s pounds) of paper shell pecans that are sweet and about an inch long of nut. That’s our share we can wrangle away from the hoards of squirrels, lol. I’ve got my Thanksgiving pies baking now and am going to try this recipe but with filo shells instead of the regular crust. Have a great holiday. By the way, having the trees are great, but never, ever park your car under them, they stain the paint.